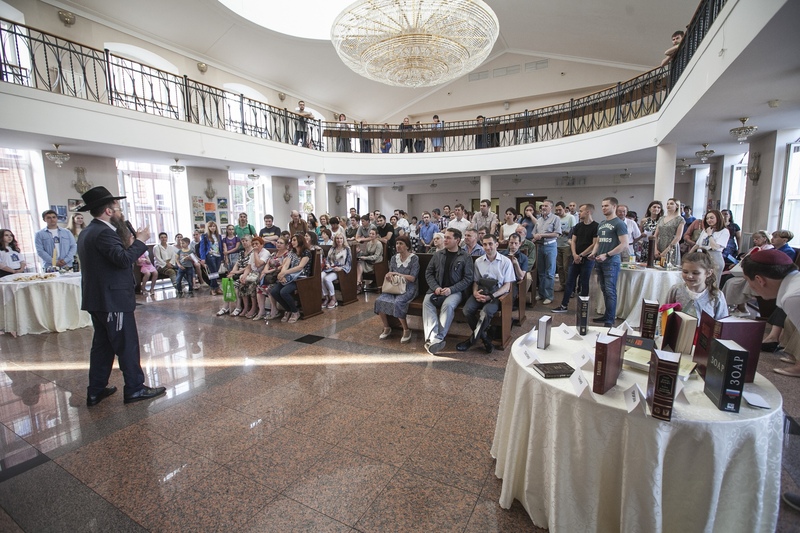 Recently an FJC synagogue in Khabarovsk, Russia’s Far-East, opened its doors to city locals welcoming them for a night of culture and ethnic education. The “Night at the Synagogue” event organized by the community with the help of the city council drew crowds of Khabarovsk residents to the synagogue, which most of them have never set foot in before. “People are usually scared of all things new and unfamiliar. But once you invite them for a popular cultural event, which these ‘museum white nights’ have become in recent years, people show their curiosity and interest,” said the community’s president Mr. Vadim Katzman in an interview to the local newspaper. The event was targeted mostly on the younger audience, but open to anyone, free of charge. “We would like for the people to see that we are an open community and that anyone, who wishes to learn more about us is welcome,” Mr. Katzman said. All three of the synagogue’s floors were open, hosting various activities, as well as the adjacent yard. The lobby hosted a staged traditional Jewish wedding – the Chupah, where the city’s Rabbi Yakov Snetkov explained some of the symbolism and traditions behind the ceremony. In the prayer hall lectures about Jewish holidays were accompanied with traditional foods, such as matzah, apples, and honey. The top floor held a Jewish ‘casino’ where Jewish trivia games winners received souvenirs treats. The basement hosted a workshop on traditional Jewish cuisine and in the cozy yard music and films were played into the wee hours of the night. “I’m very interested in all religions – their history and philosophy, and events like these really help expand one’s horizons. The synagogue was also interesting for me because my daughter lives in Israel now and I wanted to learn more about it,” said Olga, one of the event’s participants. Russia’s synagogues have been long-standing participants in the annual “Museum White Nights” event, which takes place nation-wide in many of the country’s major cities. This year, however, the official event was held on the Jewish holiday of Shavuot, with synagogues in Petersburg and Samara, as well as others pulling out of the event due to holiday observance. In Khabarovsk, however, with no other “White Nights” events planned, the synagogue was able to re-schedule and invite the wider public for a suitable date.